Four years ago, Woolaroc decided that it was time to give Frank Phillips’ wonderful museum a nice touch up. That “touch up” turned into new state of the art lighting throughout the entire museum, new wall colors, new staging of the art, new exhibits and room by room by room from the Dome Room to downstairs in Gallery 9, this graceful national treasure was carefully updated. In the process, something really special became even better. On November 23rd, the final piece of the puzzle will fall into place — Gallery 10, which use to house the Phil Phillips Colt Collection before it was relocated to Gallery 8, has been transformed into something very special. A guest touring Woolaroc will see one of the world’s finest collections of southwest art, Native American blankets, the famous Woolaroc airplane, the incredible gun collection and the reproduction of Uncle Frank’s New York City office….. your tour of this museum will conclude with a combination of nostalgia, fun and smiles. 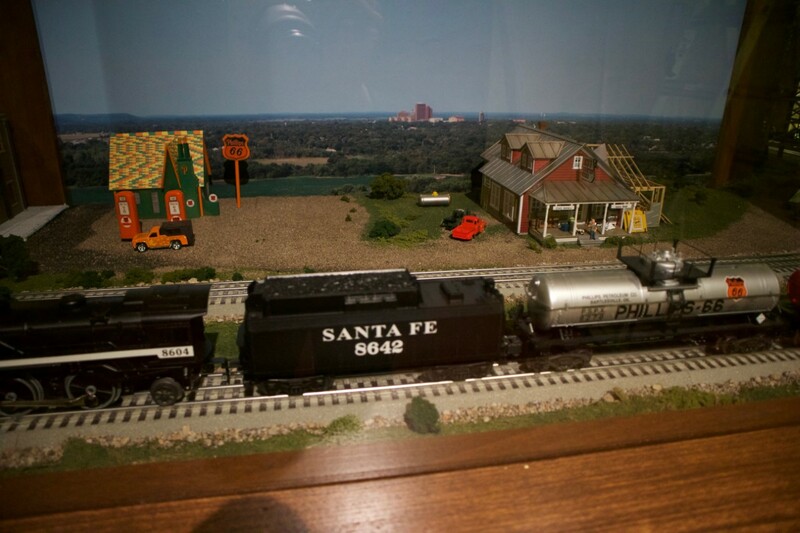 “Planes, Trains, Automobiles and Dolls” is the perfect ending to a magical tour through this national treasure…..the employees of Woolaroc invite you to come see this newest addition. Woolaroc is open Wednesday thru Sunday from 10 am to 5 pm and beginning November 25th, Wonderland of Lights will be open from 5-9 pm every Friday, Saturday and Sunday thru Friday, December 23rd.